During the during the first years of the World War One, the USA was experiencing a booming economy, with most immigration stopped due to the European war; unemployment was very low. Industrial and agricultural production was at an all time high, supplying primarily the Allied Nations with many of their weapons. When in 1917 the USA declared war on Germany, the US Army and US Marines were not in any way prepared for the modern war to come. Planners realized immediately that the supply of weapons and the industrial capacity to produce additional standard American service weapons was woefully inadequate. To meet the desperate need to rapidly equip the new army, the US Army purchased, borrowed and produced weapons, uniforms and equipment designed and produced for foreign nations, primarily England and France. Canada also faced the problem of a lack of indigenous weapons designs in production when they entered the war in 1914. At first, Canadian troops were equipped with the Canadian designed Ross rifle. The Ross was very unpopular with the troops and was quickly tossed aside and replaced by the standard British rifle, the SMLE Enfield Mk 1. British designed Enfield P-14 rifle, which was originally intended to replace the Enfield Rifle SMLE did not enter series production in England before the war. Once war broke out, two firms in the US, Remington and Winchester produced them for use by the British Army. As these contracts were fulfilled the US Army reviewed the P-14 and with a few modifications, contracted them to make Enfield P-14 rifles for US Army use. While the Springfield was the standard US Army rifle in World War One, most American troops served in combat with the American version of the Enfield P-14, as the US .30 caliber M1917 rifle. The US Army 27th Infantry Division served with British units and was equipped with the Enfield SMLE. Many other American units, mostly those serving with Commonwealth or UK units also used the Enfield SMLE. This is the rifle being used by this set of Canadian Infantry. The Stokes Mortar or in US service the 3-inch Trench Mortar, Mark I was a very popular and highly mobile mortar. These were used by most Commonwealth, UK and US forces. By the end of the war, US Army Infantry divisions were authorized 36 3-inch mortars, but often they had scrounged up more. The Stokes Mortar was an indirect fire weapon, but required an observer to watch both the location of the enemy and the fall of shot of the mortars to be fully effective. 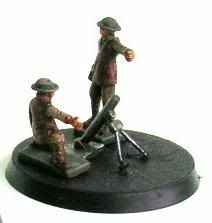 An example of this mortar is found in the HaT Canadian Infantry set. The Lewis machine gun was one of the first and most successful light machine gun designs. While it was designed by an American Army Officer, Isaac Newton Lewis the US government was not in the market for many new weapons, so manufacture was taken up in Europe. The British Army purchased them in large numbers. The Canadian Army also used them as their light machine gun. The weapon was so popular, that even Germans equipped units with captured examples. Once into the war, the US Army re-evaluated their need for a light machine gun and selected the Lewis Machine Gun in 1917. 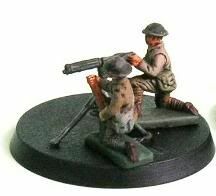 A prone Lewis gun crew is in this set. The Vickers water cooled machine gun was so reliable that it was said they would fire until the cooling jacket ran out of water or the firer ran out of ammunition. They used a heavy cloth belt of 250 rounds and in one experiment, fired over 10,000 rounds without a stoppage. 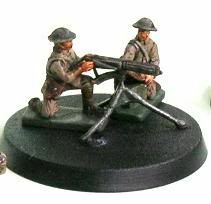 Canadian and US Army forces used these excellent machine guns in the First World War, although the French Hotchkiss was the most numerous heavy machine gun in US Army service. 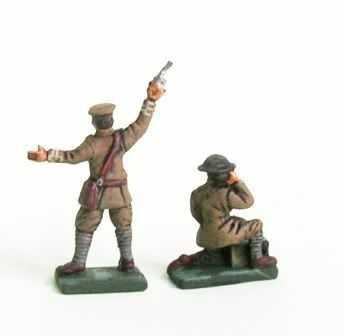 The new HaT Canadian Infantry set can be used for troops of the British Army and most Commonwealth nations. With the excellent variety of weapons, this set will also work for US Army troops as well. 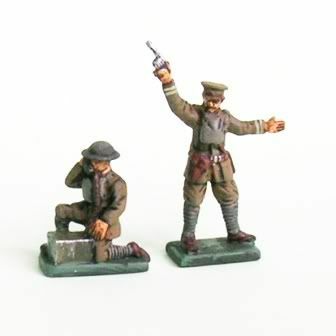 The previous release of WWI US Army troops from HaT included many late war weapons, such as the BAR and the Colt M1917 machine gun, and the much used French Hotchkiss heavy machine gun. 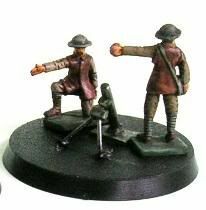 The Canadian Infantry are in the same style as the US Infantry and the two sets mix will together. Many thanks to Mr. Sander van Straeten (Netherlands) and Mr. Mike Creek (USA). www.hat.com - All rights reserved. Any unauthorized or commerical use of content or images are violations of applicable laws and will be prosecuted to the fullest extent of the law. Any trademark usage or proprietary images on this page are only for the purposes of review or such, and is considered fair dealing and permissible under the Copyright, Design and Patents Act, 1988 (UK). Copyright 2007.